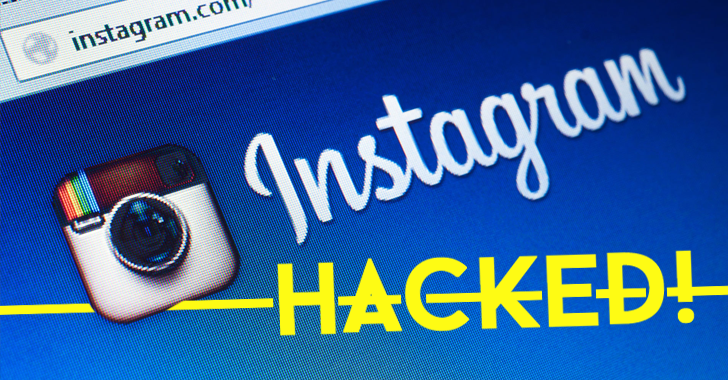 Getting hacked on Instagram is my biggest fear. My Instagram account Essere Moda is 2 years old now, where I like to show my passion and love of brands to others. Still, it happened to me on Monday, June 26, 2017 when I was in the train. My Instagram account was gone as if I did not exist in the past two years. It started on Saturday, June the 24th, 2017 when I received an e-mail from my mobile phone, through my business e-mail address. I thought it was an e-mail from Instagram, in which it appeared in English that they will block my account, because my account contained pornographic photos. Through a link, I could make a notification if the message wasn’t correct. As I read that message, I panicked. The first thing I thought of was: ‘HELP! Not my account that I’ve built for 2 years’, so I clicked on the link. I got to see Instagram’s login screen. It all seemed so real, so it made me enter my username and password. I would get a notification on Instagram where I had to click ‘It Was Me’. I’ve never received this message. The following day on Sunday, June the 26th, 2017, I received an e-mail with sender Instagram Notif. I opened the e-mail and found out that the e-mail was intended for a completely different e-mail address. It was spam, without doing anything with the e-mail I deleted it. On Monday, June the 27th, 2017, I wanted to place a Boomerang on Instagram via my mobile. At one time a screen appeared where I had to enter my phone number, which I would get a code to verify my account. Through a sms from Facebook, I received a code. After completing the code, I received a message that the code was incorrect. I clicked again on ‘send code’ and filled out the code again. This time I was notified that the code had expired. And so this went 14 times.In panic I called my boyfriend and heard from him that my Instagram account was gone. I could cry! It seemed like my world collapsed. I have become a victim of a phishing e-mail. The next day I reported to the police. Unfortunately, they could not handle my case now, because the approach to other crimes takes precedence. If they decide to investigate my case at a later time, they will let me know. It cannot just be that my account is immediately gone and cannot be retrieved?! But I don’t give up. Via google, I came to the help center of Instagram. After following the steps, I received an Instagram e-mail asking me to send one of the documents to show that it’s my business account, so I sent my Chamber of Commerce overview and my VAT and tax return. 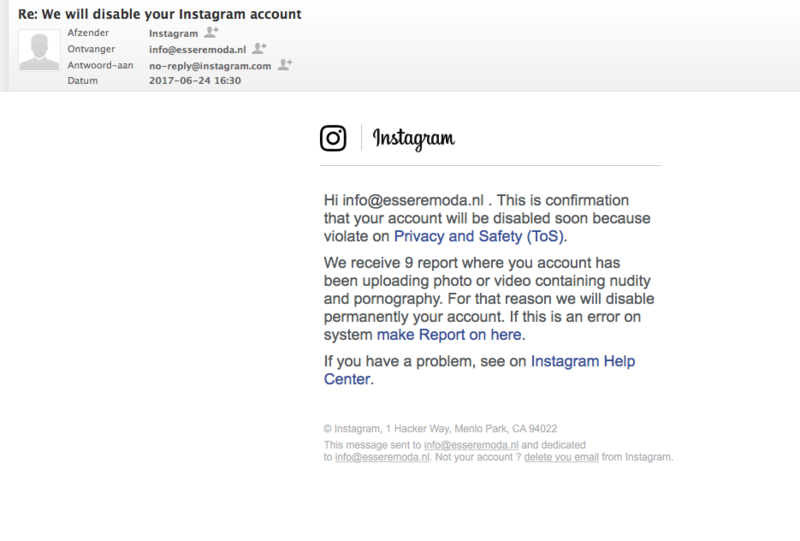 On Tuesday, June the 28th, 2017, I received an e-mail from Instagram that I could change my password. I did that, but after that I received a screen again where I had to fill out my phone number to verify my account. I was redirected to Instagram’s login screen every time. I’ve immediately sent Instagram a message to explain what I saw. 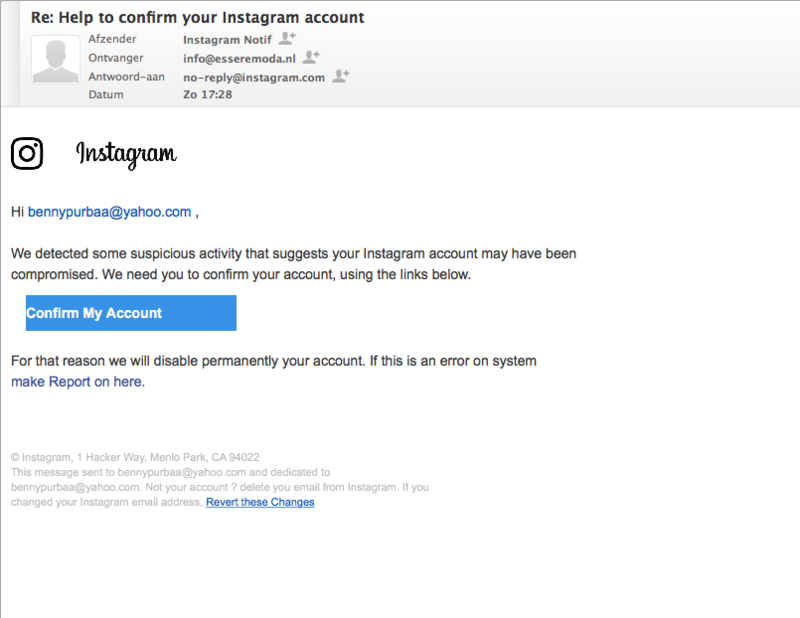 On Wednesday, June the 29th, I received an Instagram e-mail from which I could change my password. Meanwhile, a friend called me to let me know that I’m on Instagram again. I was jumping for joy! This time I could change my password without filling out a code, YAY! It was quite a process. I’ve learned my lesson. But I’m so happy and thankful that my Instagram account is back, thanks to Instagram. Previous Post Floral and fruity nuts with the new Escada Fiesta Carioca and feel the summer vibes, ARIBA!